The first gameplay trailer showed us how people and creatures would shape our experiences in the world of Red Dead Redemption 2. Now, we finally got a second gameplay trailer, as promised by Rockstar Games. This time, it is more about the missions we will undertake. This new Red Dead Redemption 2 trailer provides us with over four minutes of footage. Just like the last trailer, this one is narrated to clarify and contextualize everything happening on screen. These Red Dead Redemption 2 trailers don’t waste any time when it comes to reminding us what we’re in for, with this second one starting with a bottle break and a brawl. We then see the range of actions you can opt to partake in as Arthur Morgan. Events range from the mundane (such as dancing, taking in a show, or playing cards) to varying degrees of criminal activity (such as breaking into houses, being a loan shark, and robbing banks/trains). Most of these actions can be done with your gang, but you can also explore alone, although you’ll be more at risk with rival gangs, outlaws, and law enforcement constantly roaming about. Bounty hunters will also track you down, if a price is on your head. As far as shooting, the Dead Eye system is expanded and will progress in stages so you can slow time, paint targets, and see the critical points of enemies. Red Dead Redemption 2 is all about choice. You decide who you spend your time with, how people will remember you, what you wear, what you eat, do, and even whether or not you bathe. Lastly, we get a glimpse at how first-person mode looks and are reminded that a cinematic camera option can allow us to take in the sights. Red Dead Redemption 2 releases on October 26, 2018 for the PlayStation 4 and Xbox One. 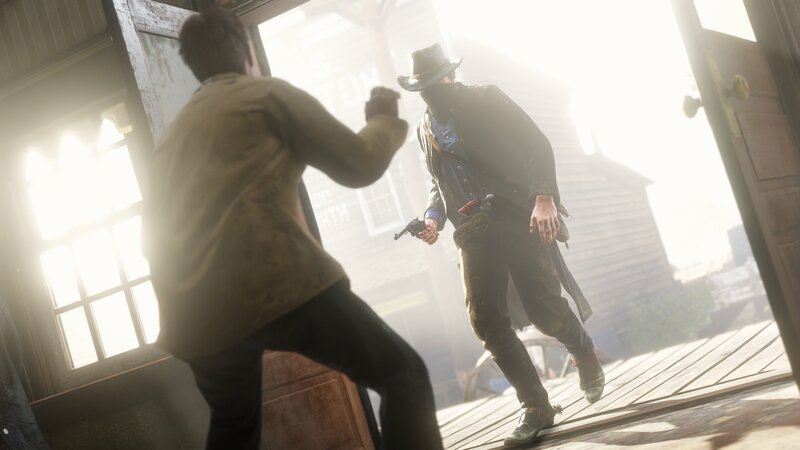 Those with the PS4 version will get to experience Red Dead Online 30 days before everyone else.